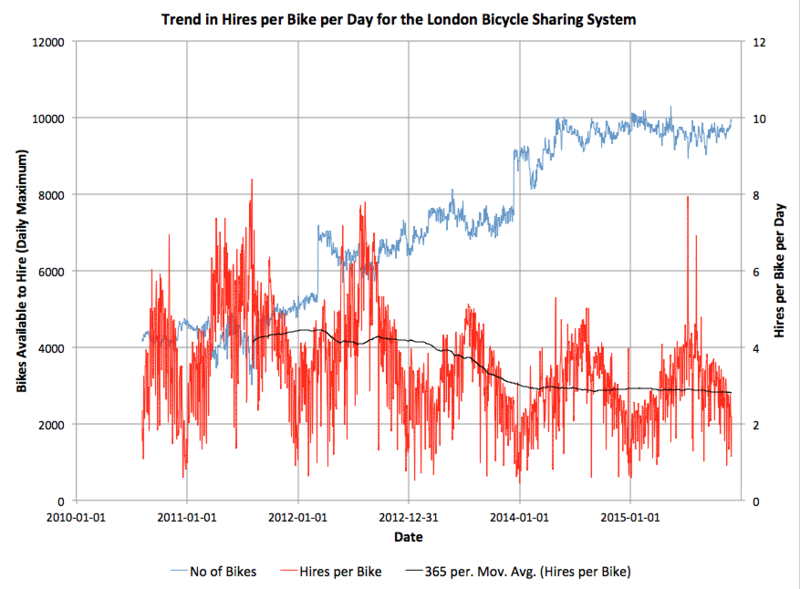 Here’s an interesting graph, which combines data on total journeys per day on London’s bicycle sharing system (currently called “Santander Cycles”) from the London Data Store, with counts of available bicycles per day to hire, from my own research database. The system launched in summer 2010 and I started tracking the numbers almost from the start. 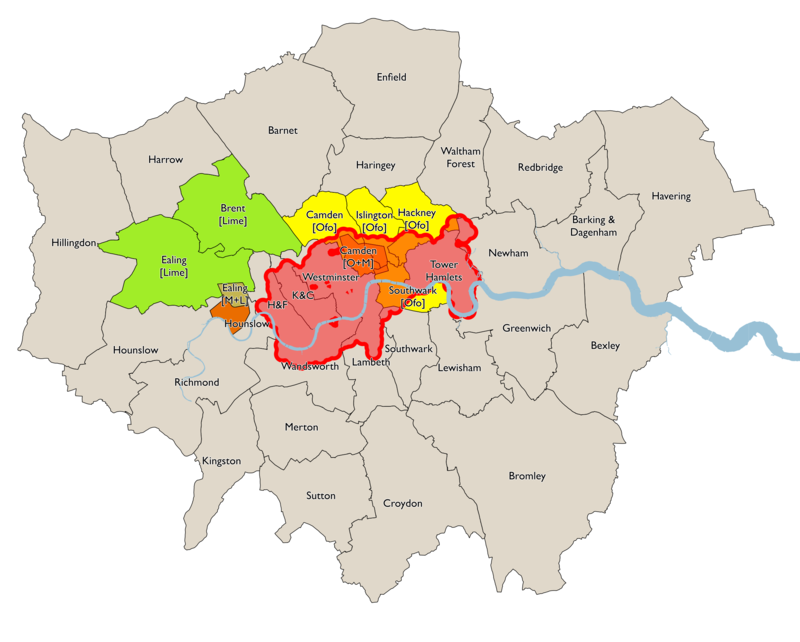 You can see the two big expansions of the system as jumps in the numbers of available bikes – to all of Tower Hamlets in early 2012, and to Putney and Fulham in late 2013. 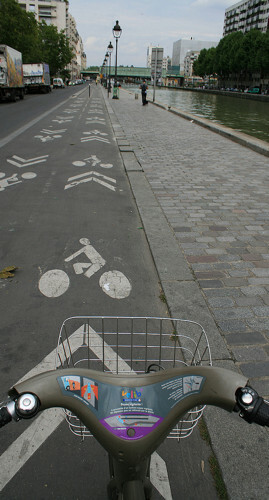 Since then, the system has somewhat stagnated in terms of its area of availability, although encouragingly at least the numbers of available bikes has remained constant at around 9500, suggesting that at least the operator is on top of being able to maintain and repair the bikes (or regularly source new ones). 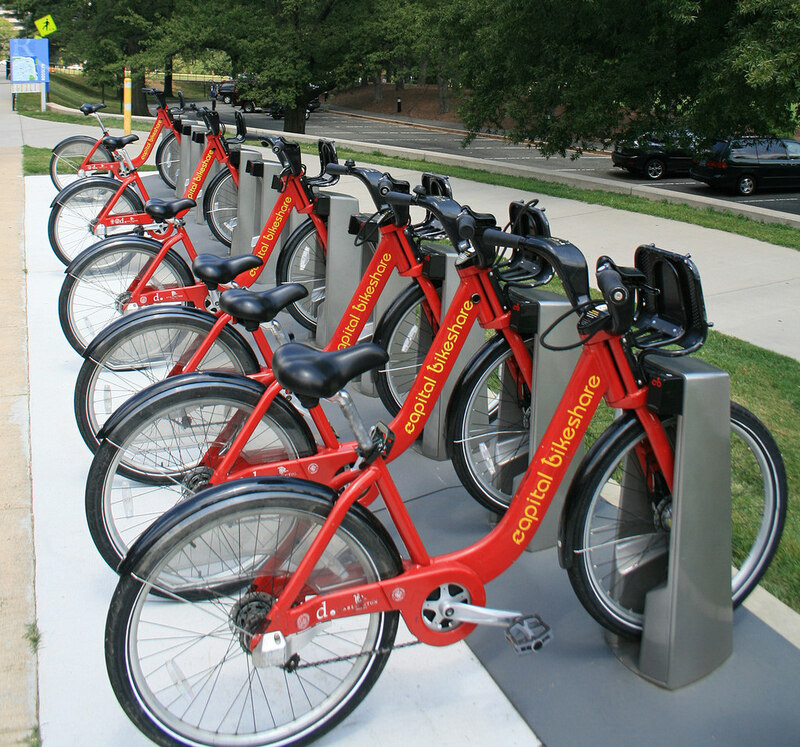 Some of the individual bikes have had 4000 trips on them. There is a small expansion due in the Olympic Park in spring 2016, but the 8 new docking stations represents only a 1% increase in the number of docking stations across the system, so I doubt it will have a significant impact on the numbers of available bikes for use. There is a general downward trend in the numbers of uses of each bike per day, since the halycon Olympic days of Summer 2012, over and above the normal seasonal variation, which concerns me. The one-year moving average recently dipped below 3 uses of each bike per day, this summer, and I am not confident it will pick up any time soon. (The occasional spikes in uses/bike, by the way, generally correspond to sunny summer bank holidays, tube strikes and Christmas Day). To rejuvenate the system and draw in more users, rather than relying on the established commuter and tourist flows which likely dominate the current usage, I am convinced that the system needs to expand – not necessarily in terms of the number of bikes or docking stations, but in its footprint. I think the system would be much improved by dropping the constraining rule on density (which approximates to always having one docking station every 300m) and instead redistributing some of the poorly performing docking stations themselves further out. It’s crazy that, five years on, there are no docking stations in central Hackney, Highbury, or Brixton, three areas with an established cycling culture and easily cycle-able into the centre of London. Conversely, Putney and Tower Hamlets simply don’t need the high density of docking stations that they currently have, except in specific areas (such as around the train/tube stations in Putney, and Canary Wharf). Ideally we would have a good density of docking stations throughout cycleable London but, as docking stations (and bikes) are very expensive, I would suggest that TfL instead adopts the model used in Bordeaux (below). Here, the city retains a high-dense core serving tourists, commuters and other centrally-based workers, but adopts a much lower density in the suburbs, so that, while tourists can still “run into” docking stations they don’t know about in the centre thanks to the high density, local users can benefit from the facility in their neighbourhood too, even if it requires a little longer walk to get to it. 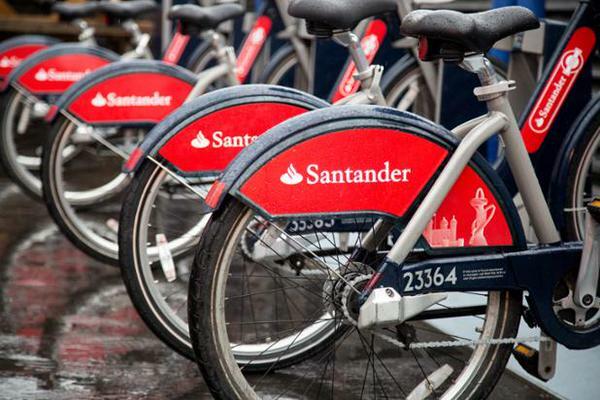 Technical note: Before November 2011, the London numbers included bicycles that were in a docking station but not available to hire (i.e. marked as broken). This exaggerates the number of available bikes (and correspondingly reduces the number of hires/bike/day from the true value) in this period by a small amount – typically around 3-5%, an effect I am not considering significant for this analysis. Living Somewhere Nice, Cheap and Close In – Pick Two! Skip straight to the 3D graph! When people decide to move to London, one very simple model of desired location might be to work out how important staying somewhere nice, cheap, and well located for the centre of the city is – and the relative importance of these three factors. Unfortunately, like most places, you can’t get all three of these in London. Somewhere nice and central will typically cost more, for those reasons; while a cheaper area will either be not so nice, or poorly connected (or, if you are really unlucky, both). Similarly, there’s some nice and cheap, places, but you’ll spend half your life getting to somewhere interesting so might miss out on the London “experience”. Ultimately, you have to pick your favoured two out of the three! Is it really true that there is no magic place in London where all three factors score well? To see the possible correlations between these three factors, I’ve calculated the ward* averages for these, and have created a 3D plot, using High Charts. Have a look at the plot here. The “sweet” spot is point 0,0,0 (£0/house, 0 score for deprivation, 0 minutes to central) on the graph – this is at the bottom left as you first load it in. Use your mouse to spin around the graph – this allows you to spot outliers more easily, and also collapse down one of the variables, so that you can compare the other two directly on a 2D graph. Unfortunately, you can’t spin the graph using touch (i.e. on a phone/tablet) however you can still see the tooltip popups when clicking/hovering on a ward. Click/touch on the borough names, to hide/show the boroughs concerned. Details on data sources and method used are on the graph’s page. 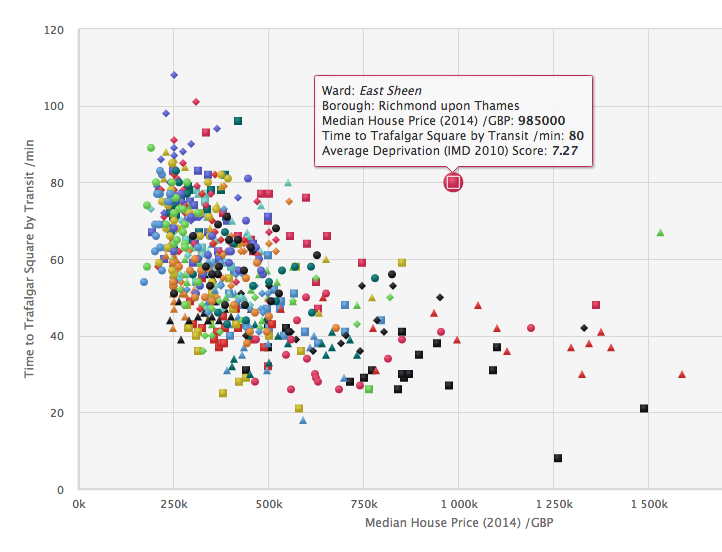 The curve away from the sweet spot shows that there is a reasonably good inverse correlation between house prices and deprivation, and house prices and nearness to the city centre. However, it also shows there is no correlation between deprivation and nearness. Newington is cheap and close in, but deprived. Havering Park is cheap and a nice area, but it takes ages to get in from there. 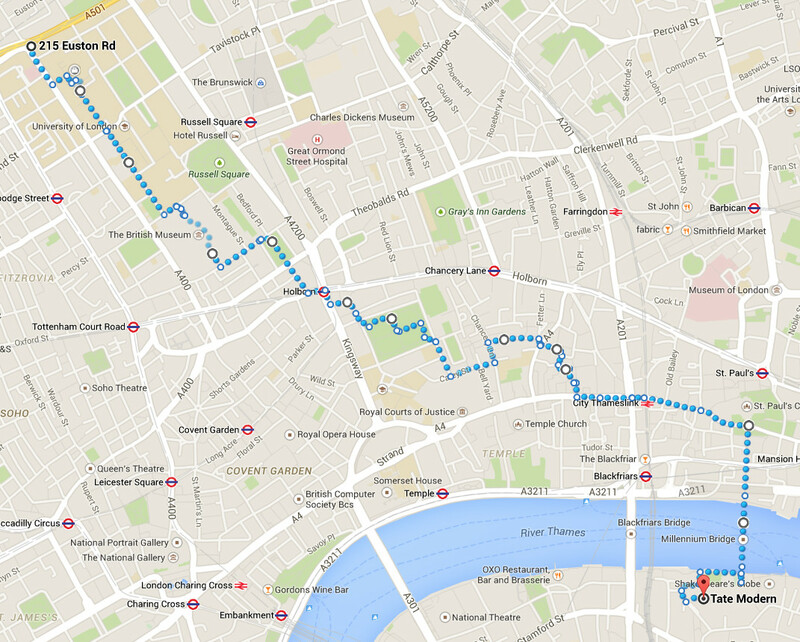 The City of London is nice and close by – but very expensive. 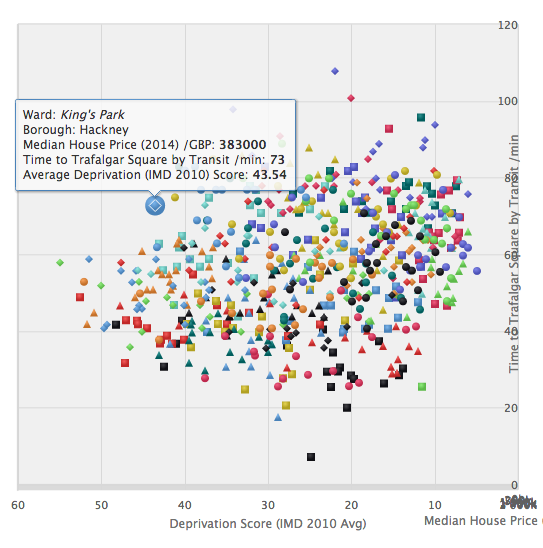 Other outliers include Merton Village which is very nice – but expensive and a long way out, while Norwood Green (Ealing) is deprived and far out (but cheap). Finally, Bishop’s in Lambeth is expensive and deprived – but at least it’s a short walk into the centre of London. Try out the interactive graph and find the area you are destined to live in. p.s. If you are not sure where your ward is, try clicking on the blobs within your borough here. 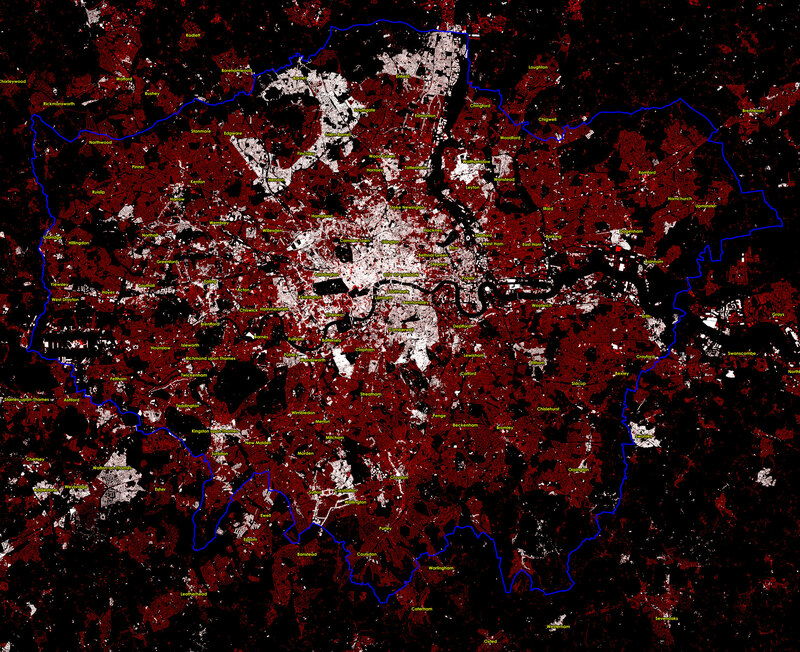 * Wards are a good way to split up London – there are around 600 of them, which is a nice amount of granularity, and importantly they have real-world names, unlike the “purer” equivalent Middle Super Output Areas (MSOAs). Using postcode “outcodes” would be even better, as these are the most familiar “coded” way of distinguishing areas by non-statisticians, but statistical data isn’t often aggregated in this way. 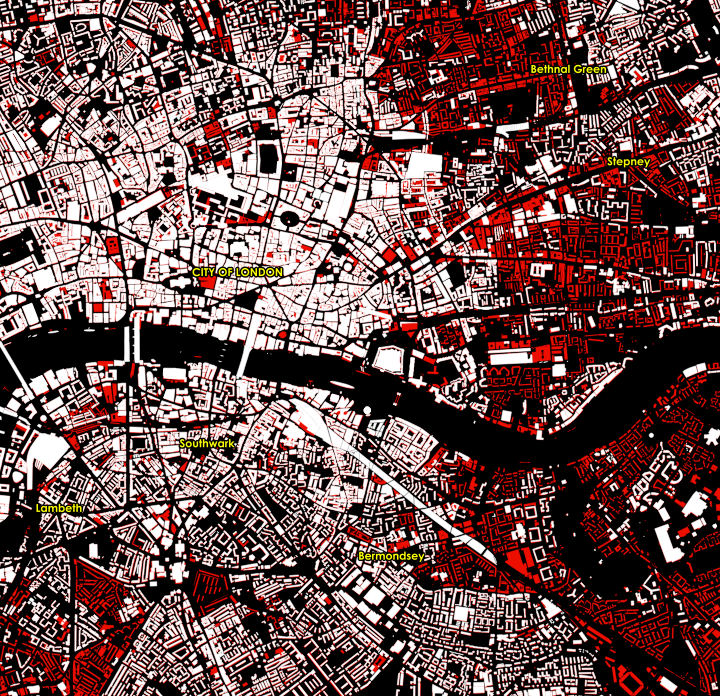 Here’s a graphic I’ve made by taking a number of screenshots of DataShine Commute graphics, showing the different methods of travelling to work in the City of London, that is, the Square Mile area at the heart of London where hundreds of thousands and financial and other employees work. 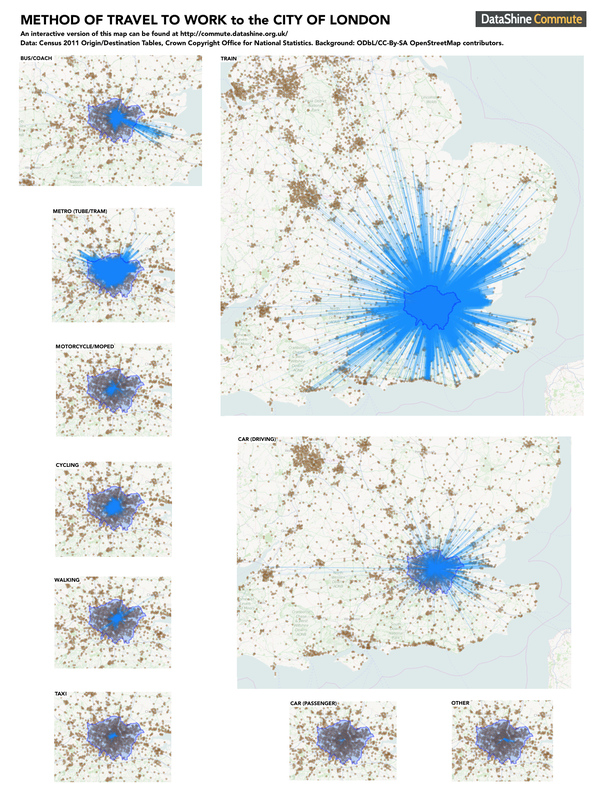 All the maps are to the same scale and the thickness of the commuting blue lines, which represent the volume of commuters travelling between each home area and the City, are directly comparable across the maps (allowing for the fact that the translucent lines are superimposed on each other in many areas). I have superimposed the outline of the Greater London Authority area, of which the City of London is just a small part at the centre. There’s lots of interesting patterns. Commuter rail dominates, followed by driving. Car passenger commutes are negligible. The biggest single flow in by train is not from another area of London, but from part of Brentwood in Essex. Taxi flows into the City mainly come from the west of Zone 1 (Mayfair, etc). Cyclists come from all directions, but particularly from the north/north-east. Motorbikes and mopeds, however, mainly come from the south-west (Fulham). The tube flow is from North London mainly, but that’s because that’s where the tubes are. Finally, the bus/coach graphic shows both good use throughout inner-city London (Zones 1-3) but also special commuter coaches that serve the Medway towns in Kent, as well as in Harlow and Oxford. “Other” shows a strong flow from the east – likely commuters getting into work by using the Thames Clipper services from Greenwich and the Isle of Dogs. 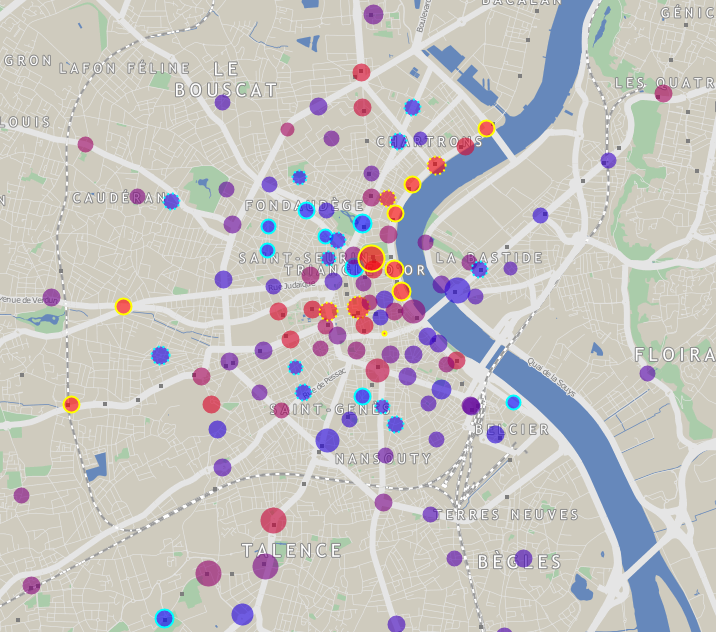 Try it out for your own area – click on a dot to see the flows. There is also a Scotland version although only for between local authorities, for now. Click on the graphic above for a larger version. DataShine is part of the ESRC-funded BODMAS project at UCL. I’ll be talking about this map at the UKDS Census Applications conference tomorrow in Manchester. Stations on the tube map with multiple lines are normally shown with a white circle (except where obscured by a disabled access blob) indicating connections where you can change lines there, while continuing on a single journey (and so not have to pay for two). However, there are a number of connections not shown on the map. These are Out of Station Interchanges (OSIs) and generally involve a walk out through ticket barriers, along a road or two, and back through more barriers. However, TfL will do the maths to ensure that you still only get charged for a single journey altogether – so long as you don’t spend too long a time between the two sets of barriers. TfL is quite secretive about these “hidden” free interchanges, likely because marking/highlighting the links and limit times would be tedious* so the current list is maintained by frequent Freedom of Information Requests. I’ve taken the current list, excluded interchanges with National Rail, and added the remaining (TfL to TfL) OSIs to my Tube Data Map. The OSIs are shown by white circles, connected together with white lines and black borders. There are a few more, where I’ve already joined OSI-linked stations as being actually in the same place. Sometimes you can leave and then reenter barriers within a single barriered area – for instance, you can leave the barriers at Bank and go back in them at Monument, without paying for two journeys (so long as you take less than 15 minutes to do so). However you can also get between the two stations while staying behind the barriers. N.B. If you change the date to 2019 then it shows the OSIs that will likely be added for Crossrail, when the central section starts running then. 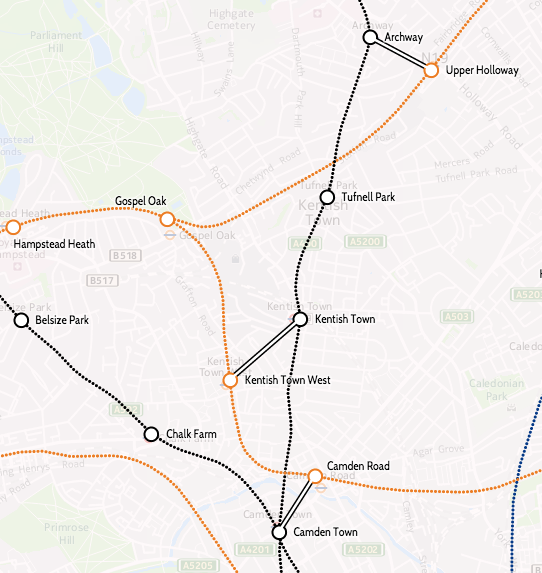 Many of the OSIs are for links between the Underground and Overground, as the latter network is not otherwise particularly well connected. The longest Tfl-TfL OSI is from West Ruislip to Ickenham, in outer west London – it’s over a kilometre to walk between the two, but the link helps Central Line uses get easily to and from the transport hub at Uxbridge. * They do however highlight a few at stations, e.g. Clapham High-Street to Clapham north. Some others have some street-signs pointing the way, e.g. Seven Sisters to South Tottenham. Map background from HERE maps. Taking the Scenic Route – Quantitatively? A friend forwarded me this article which discusses this paper by researchers at the Yahoo Labs offices in Barcelona and the University of Turin. 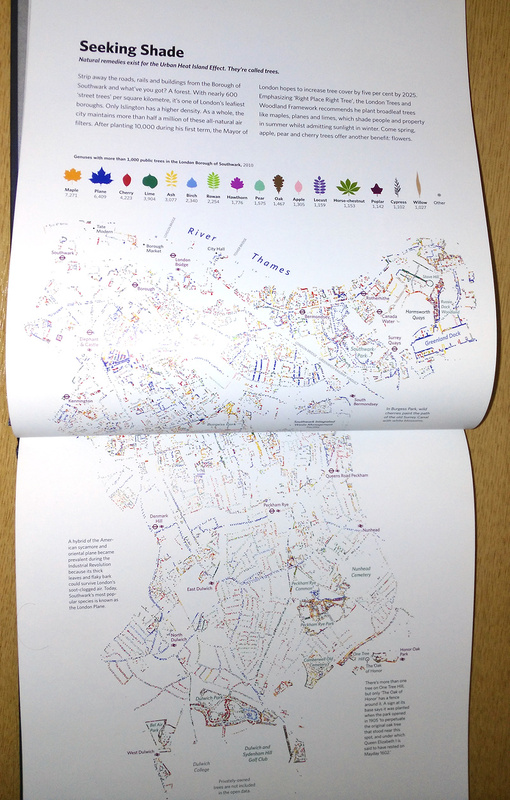 The basic idea is that they crowdsourced prettiness of places in central London, via either/or pairs photographs, to build up a field of attractiveness, then adjusted a router based on this map, to divert people along prettier, happier or quieter routes from A to B, comparing them with the shortest pedestrian routes. The data was augmented with Flickr photographs with associated locations and appropriate locations. and The article that featured this paper walked the routes and gives some commentary on the success. 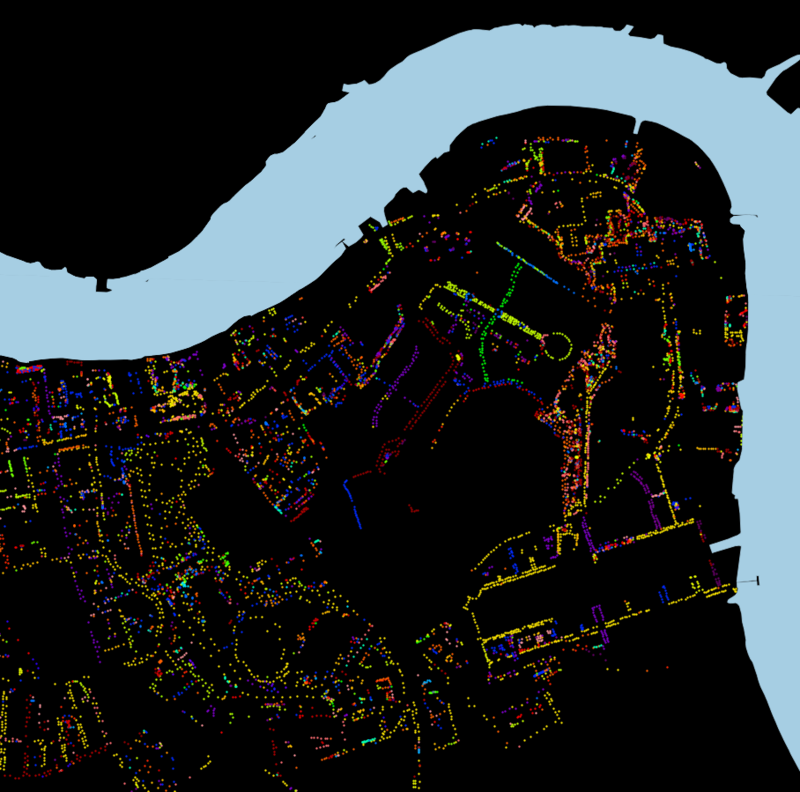 Quantitatively building attractive routes is a great idea and one which is only possible with large amounts of user-submitted data – hence the photos. It reminds me of CycleStreets, whose journey planner, for cyclists, not only picks the quickest route, but adds in a quieter (and “best of both worlds”) alternative. Judging locations by their attractiveness also made me think of the (soon to be retired) ScenicOrNot project from MySociety which covered the whole of the UK, but at a much less fine-grained scale – and without the either/or normalisation. The vista from St Paul’s Cathedral, across the Millennium Bridge to the Tate Modern. Maps in this article are © Google Maps. How many of London’s 32 boroughs (& the City of London) would you pass through on a single end-to-end journey on the tube? 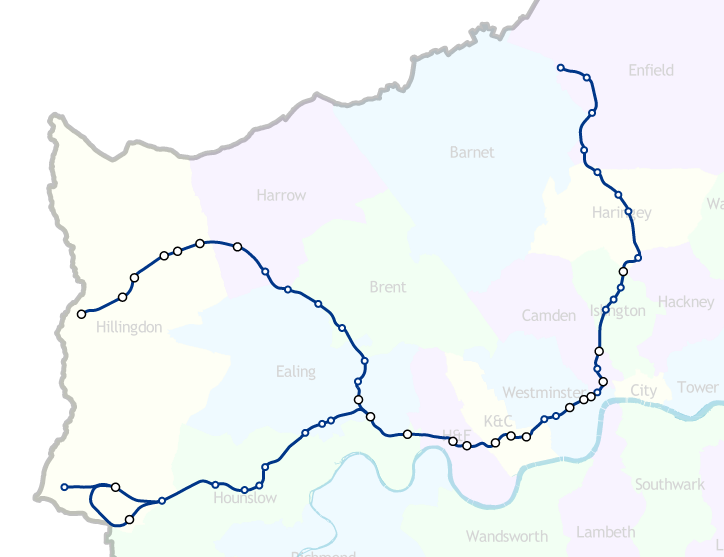 It turns out that if you travel the length of the Piccadilly Line (Uxbridge branch), then, in a single journey, you’ll pass through 14 boroughs (and stop at least once in all of them but Barnet). That’s more of London than if you travel on any single Crossrail journey, once it opens in 2018. See for yourself at http://vis.oobrien.com/tube/#map.